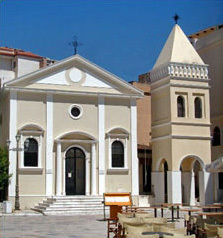 This church, the biggest in the city, is dedicated to the protector of the island and it is located along the seashore of Zakynthos. It was built in 1948 and it resisted the earthquake in 1953, now its bell tower is very high and stands out among the different buildings recognizable as soon as you enter the port. Even if it hasn’t got any particular exterior characteristics, when entering you are impressed by the quantity of frescos, lamp holders and colours. Among the artists that contributed to the magnificence of this church there are the painter Doxaras and the chaser Bafas who engraved the silver reliquary in where there are the mortal remains of Saint Dionysios. The bell tower, being surrounded by numerous bulbs, during the night it is enlightened creating a lovely view. 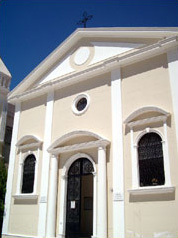 This church located in Solomos square is the only building in Venetian style that survived the earthquake in 1953 and has been restored keeping its original characteristics. 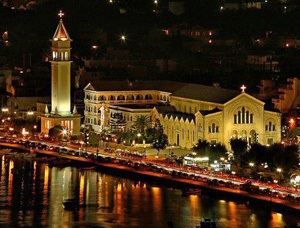 Originally the church had been built on an island connected to the mainland by a bridge, then the island joined the city. For many centuries the church belonged to the Sailors Corporation. Dated back to the 17th Century it is the most ancient building in Solomos square and it was built in renaissance style with the exception of the bell tower that is more Byzantine. 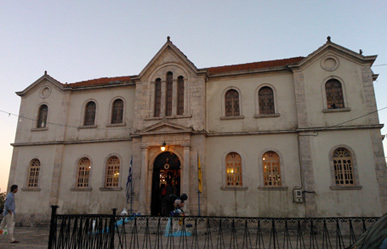 Inside there are the liturgical ornaments of Saint Dionysios, the island protector, that for a period in his life gave his services to this church. 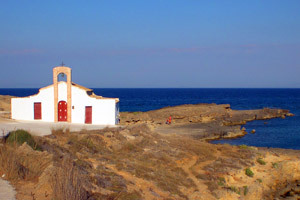 Very small it is the only catholic church of the island. 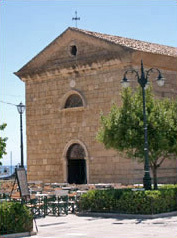 Next to the Museum of Solomos and Kalvos, it looks like a single building since built with the same style. During the summer a Mass in English is celebrated every Saturday at 19.00 and Sunday at 10.00 and 19.00. 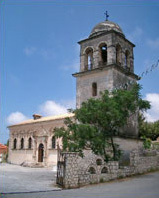 As soon as you reach Kiliomeno the majesty of the bell tower and the huge dimension of the church strike the visitor. 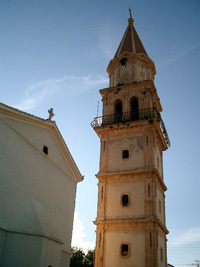 The church and the bell tower are separated by a street and look like two different buildings even in the exterior aspect. 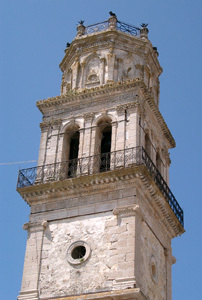 The bell tower with a squared base has four floors and at the third it is possible to admire two arches and at the last, with and hexagonal base, numerous decorations in relief. Located in the centre of Macherado, it is very peculiar both inside and outside. In addition to the many frescos there is an icon representing the saint to whom the church has been dedicated; according to the legend the icon is dated back to the third century a.C. and comes from Egypt where Saint Mavra lived and underwent martyrdom. In the small mountain village of Kerì, south of the island, there is a very big church surrounded by a park. It is easy to be found since from the huge bell tower, the bell dongs are heard all over the town and stress the passing of the hours in a village where the time seemed to have stopped a century ago. Once in Agios Nikolaos, beach in the south part of the island (pay attention there is another town with the same name in the northern part) on your left you’ll notice a thong of land on which lies a small white church. The church has no name nor other information and it is not possible to enter but is open to celebrate weddings. Along the road from Zakynthos to Kalamaki you may find, among the olive trees on the left, a small church risen up the hill; the small white and light blue bell tower with two small bells and a cross on the top plus a small part of the main body is what remains of the original church. It looks like a whole with the rock and this rends it unique and to be visited. 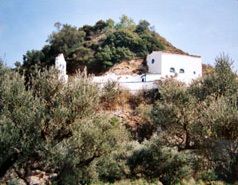 At the top of the Skopos mount, at the back of the town of Argasi, there is a small monastery castled build in honour of the Holy Mother in the 15th Century. From this monastery, surrounded by nature, it is possible to view the entire island, an unforgettable landscape that the Venetians appreciated and to which they gave the name of Belvedere. It was built on the ruins of the ancient temple of Artemis in Byzantine style; the cross plant and the interiors rich of frescos render the church very characteristic. The only problem is the road to reach the church that is not indicated and most importantly the last stretch is unpaved. North of the island in a small village of the inland, Orthonies, it is possible to visit the monastery of the Holy Mother of the cave (Spiliotissa) that was built in the 16th Century. This monastery looks like if it has been built at the edge of a gully and it is surrounded by greenness and the landscape is rich in vegetation. In this moment is possible only to look at it externaly because the inside is not accessible. 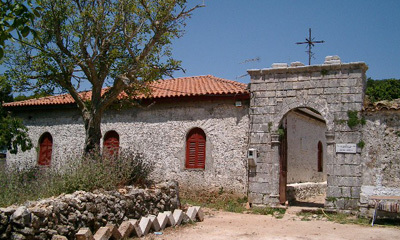 To reach this monastery you have to pass the town of Kiliomeno and take a side road on the right. The road to be run is long but in the green with flowered fields on both sides. 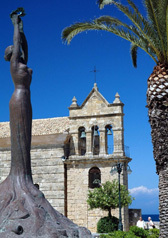 Once there you reach a small monastery founded in the 17th Century and dedicated to the Holy Mother. Not much remains of the splendour of the past but the feeling of peace here is complete. In the town of Anafonitria besides the Monastery of the Holy Mother there is the one of St. George Krimnon built on a promontory from where you can look at the sea. Entering the courtyard of the monastery it is possible to admire on the left the abodes of the resident inhabitants of the monastery, in the middle the tower and on the right a small church. 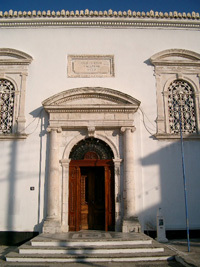 We do not know when the church was built, but it was destroyed by pirates in 1553 and then rebuilt in Venetian style. The circular tower was built to defend the monastery from assaults. Located in the greenness it is a stop for many tourists. The medieval tower of the 15th Century that you can see immediately at the entrance, is very interesting. The tower, in part destroyed, has at the top four arches and a cross and it is used as bell tower whereas in the past had been built as a defence. Inside the church there is an icon of the Virgin dated back to the 15th Century and it is of high value, coming from Costatinopolis; there are many frescos on the walls too. Here St. Dionysios took refuge and lived as a monk. 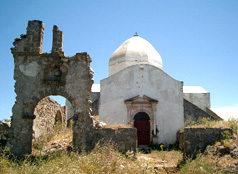 As soon as you leave Macherado, going North you reach on the left the monastery of the Liberator Holy Mother (Eleftheotria). From outside it looks more like being in a castle than in a monastery and the towers battlements are very characteristic so as the white and red of the windows and the arches of which the building consists. 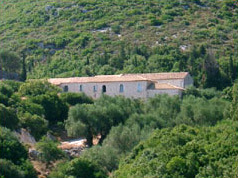 The view from the monastery is toward the plain of Zakynthos and you are charmed by the rich vegetation. Today it is a nunnery that is possible to visit inside. 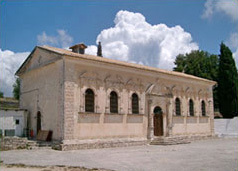 In the past this post Byzantine monastery, located on the mountain north of Alykes, in the past has been used for its position has a rest area for the pilgrims even though the masterpieces that are there are of great value. It is possible to see the icons of the famous painters Poulakis and Bafas and precious wood faldstools. The complex includes a simple abbey, a two floors building and a tower with circular base, built in the past as a defence.